Firing up the ol' outdoor grill is an American pastime. There is something about gathering around the grill and cooking up some good food that just says relaxation and celebration. There is no better way to enjoy an afternoon or evening with family and friends. And that is just the ambiance! I haven't even mentioned how great the grilled food is cooked on an outdoor grill! The caramelization of the meat, the smokey flavors...mmm, I'm getting hungry! So you've decided to buy a barbecue. There are so many choices! Different producers, different models, charcoal versus gas, portable grills, natural gas grills, even a smoker grill that looks like a big green egg! Where to get started?! 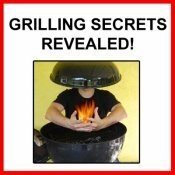 My ebook will show you all the details you need to know to use that new grill of yours and produce amazing grilled foods! Below you will find information about a veritable cornucopia of grills and barbecues! Charcoal Grill - This is the classic outdoor grill and barbecue! The trusty old charcoal grill is versatile and cooks great food. Charcoal is a great fuel for producing long-lasting, smokey heat to cook all your grilled foods. A bit more messy and time consuming than gas grills but dedicated users feel the flavor is worth it. Check out my new favorite charcoal grill & smoker, the Big Green Egg! Gas Grill - A gas grill, usually fueled by a propane tank, is fast, clean and easy. It cooks great grilled food and with the addition of a smoker box to hold some mesquite, hickory or other smoking woods you can even get some of those great smoke flavors. Many gas grills now come standard with a rotisserie attachment! Natural Gas Grill - These outdoor grills plug right into your natural gas line so that you don't ever have to go buy more propane. No more worrying about running out of fuel in the middle of your dinner party! Besides, natural gas burns cleaner than propane and is better for the environment. There are specific barbecues made to work with natural gas or you can convert a propane grill. Fire pit grill - Don't forget fire pits! This is the Fire Pit and Grilling Guru's website after all. A fire pit with a grill allows you to have a blazing firewood fire and cook on it as well! Cooking on real firewood is great, natural and fun. Learn all about types of fire pits and about fire pit cooking. Smoker Grill - A smoker grill makes it easier to slowly smoke foods at low heat using aromatic smoking woods for intense flavor and tender meat. While you don't have to have a dedicated smoker to do this, it can help make it easier. Terra Cotta or Ceramic Grill - You see a lot of ceramic terra cotta grills in other countries. They are generally inexpensive and pretty portable. 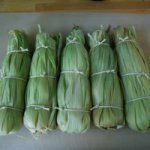 They are great for a small, fast-grilling option but have some disadvantages too. The cute pig shaped one I've got has been quite popular! Electric Grill - If you are tired of the hassle of charcoal, wood or propane tanks, one alternative for an outdoor grill is an electric model. Learn about the advantages and disadvantages of these grills here. Barbecue Rotisserie - A barbecue with a rotisserie built in can greatly expand your grill cooking repertoire. Cook large roasts that are succulent, tender and juicy, never dry and leather-like. Portable Grill - Your big outdoor grill at home may not be that easy to transport. The solution? A smaller portable grill that you can take on camping trips, to the beach, park, lakeside, or summer country cabin! There are several options available, in charcoal, gas and electric models. Also check out information on Weber portable grills and portable Char-Broil grills. They have several types! Built in Grill - A great option for those with a big back yard with a deck or pool-side structure. Have a permanent built in outdoor grill installed! These are available in both propane gas and natural gas models. Lynx grills all come in built-in versions which can be customized to build your outdoor kitchen. Homemade Grill - If you've ever thought of building your own grill, this beautiful homemade parrilla grill is quite inspiring. Submitted by a real reader who designed and built it himself, it is a great option for an outdoor grill on a deck or patio. You can see the actual, original construction plans on the build a grill page. 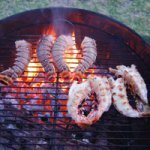 Which Type of Outdoor Cooking Grill to Choose? A Head to Head Comparison. - Here is a brief pros and cons comparison of the different types of outdoor cooking. Looking for information on a specific outdoor grill? Weber Grill - The Weber grill is one of the most familiar and ubiquitous barbecues in the world. The classic Webber kettle grill is familiar from a mile away. Well Weber grills are also well built and perfect for grilling finger-likin' good barbecue meals! There are several models available. Learn more about the Weber gas grill, Weber charcoal grill and Weber portable grill lines. Char-Broil Grills - Char-Broil is another company making great barbecues in a variety of styles with several models available. They have different styling and features than Weber grills. Learn more about the charcoal and smoker Char Broil grill line and the gas CharBroil grill line. The Big Green Egg Smoker Grill - This is my new favorite charcoal grill and smoker! This ceramic grill retains heat and has superior precise control of your heat throughout the range of cooking temperatures, from slow-cooked smoking to high-heat searing, and it retains moisture so you food stays juicy and delicious! Do not miss checking out the Big Green Egg! Lynx Grills - Lynx may not be as familiar a name as Weber, but make no mistake about it, these are the Mercedes-Benz of gas and natural gas grills! Sleek styling, superior craftsmanship and customizable features galore, these are the grills for those looking for the top of the line and money is no object. Viking Grills - Viking is one of the biggest name in cookwear, making some of the best stoves and ovens which are used by professional kitchens around the world. But did you know they also make top-of-the-line gas and natural gas grills? 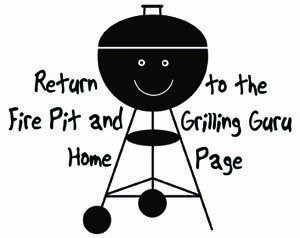 Return to the top of the Outdoor Grill and Barbecue page.